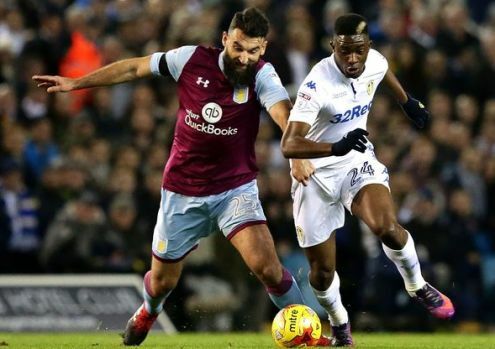 Leeds - Aston Villa predictions, betting tips and preview 01 Dec 2017 – The hosts will be able to take one point. Leeds - Aston Villa predictions for England Championship match at Elland Road, Leeds. The Peacocks are good enough to hold visitors to a draw. Read on for live streaming info and our free predictions. Do you want to watch live streaming of Leeds - Aston Villa and bet live? Go to bet365 Live Streaming and place winning bets! Despite the failed mid-autumn, Leeds are still among the leaders and lag behind promotion zone by only three points. The Peacocks started the season vigorously, having managed to win five games and tie two, while conceding goals only in one of these seven. Then it seemed that United will be the main contender for the title, but in September, something broke in well-oiled Leeds machine, and the team suffered seven defeats in nine rounds… Perhaps the cause of this crisis was an unsuccessful play in the defence, because the Peacocks conceded in 10 of 12 last games, but after 3 consecutive home defeats, the hosts were heavily criticized and soon managed to perform a real miracle, confidently defeating one of the strongest clubs in the division, Middlesbrough. It became obvious that the team had recovered and ready to forget the middle of the autumn, like a nightmare, and despite Leeds suffered a crushing defeat in Wolverhampton in the next game, it was clear – United are back! It’s worth to remark that no one is able to play the Wolves even now, so no need to make this defeat more dramatic than it needs to be. At the weekend, Leeds beat Barnsley on the road without any problems with a score of 0-2 and are ready to host visitors from Birmingham, but Aston Villa are unlikely to receive a warm welcome today! Aston Villa look just unbeatable – they have lost only two rounds from the last sixteen, while being able to win in nine of the twelve previous. Nevertheless, it should be noted, that the schedule was uncomplicated for the Villains, and their victories were mostly by only one goal, so let us do not overestimate them! The hosts will be able to offer rebuff to a stronger rival and take at least one point today.